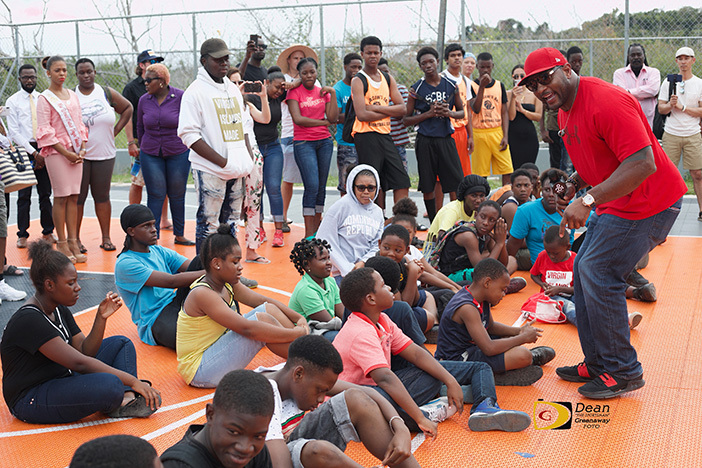 Former Baltimore Ravens Hall of Fame linebacker Ray Lewis, stood on a basketball court at the Youth Empowerment Project in Fat Hogs Bay before four groups of 50 young British Virgin Islanders with an inspiring message last Thursday afternoon, before he sat down with a small group to kids to answer questions such as how he became a football player to what he eats. Britnie Turner, who has been doing the BVI Strong Series since Hurricane Irma and promoting the territory, arranged the trip to YEP for Lewis, who was on Necker Island. Lewis who had a rough childhood and his mother couldn’t afford the $15 for him to attend a football camp which a coach paid for when he was 10 and grew up without a father in his life, began by telling his young audience that when something is taken away from you, that’s when your greatest self becomes available. The 2012 Super Bowl MVP further told them that they’re not going to find greatness until their comfort zone is disturbed. Lewis spoke about growing up without his father, hearing his mother crying one day when they had nothing to eat but a bag of candy. He couldn’t do anything to stop her trying and began trying to figure out where life would take him next, before picking up a bible, began reading Psalms and Proverbs, then realized God wanted to use him even in his darkest hours. Years later he said, he thanked his father for not being in his life, because being that uncomfortable because everything was taken from him, made him chase something that he couldn’t see. Lewis told his captive audience that in whatever they do in life, someone is always watching them. He said it’s not what you have been through, but where you’re going. Furthermore, he encouraged them to not to let anyone dictate their journey, but their effort. YEP Executive Director Stacy Mather, said the energetic Lewis was phenomenal. The children he noted were excited and had a prelude to his message via YouTube. Afterwards sitting with a small group, Lewis said the message he was trying to get across is that young children sometime think they’re the only ones going through something and they don’t believe in themselves, which is a cultural problem. Everything is about instant gratification.